Dee mentions the BBC television programme, Dragons’ Den. Announcer: You’re listening to the Masterclass series from Essential Business Radio. Julie Stanford talks to the experts. In this programme, we hear from marketing expert, Dee Blick and find out how to deliver an effective message to your target audience. Julie Stanford: If you could just talk today about why it’s vital to develop your positioning statement and possibly even explain what that is, or it’s also known as a benefit statement I believe, isn’t it? Julie Stanford: Do you mind just talking for a little bit about what that is first of all, so that people understand? Dee Blick: You’ve hit the nail on the head. The positioning statement is what we marketers call it, but really it’s simply a statement of the benefits that a business offers to the different audiences that they want to reach. Why is it so important? In my experience, most small businesses undersell themselves. The reason why they undersell themselves is because they trot out the same old stuff that everybody’s trotting out. They say things like, “We’re great on customer service. You’ve tried the rest, now try the best.” The things that really, I always say it could be a shopping list that applies to any business, and it’s because they actually haven’t sat down and thought about what they are offering and what makes them so exceptional. At the other end of the scale, I think that businesses struggle to write their sales literature. Often it just becomes a shopping list of what they offer rather than the real benefits. Again, it’s perhaps because they’ve not worked with somebody or asked their clients, “What are the benefits that we really offer? Why do you want to do business with us?” The issue then is that their sales communications are boring. I often think you can take the business name off and stick any other name onto it and you wouldn’t know the difference. If there’s one thing about a small business, we’ve got to stand out. We’ve got to be really visible and stand out for the right reasons. We can’t afford to duck under the duvet and just trot out what everybody else is doing. Otherwise, we just become like wallpaper and that is the problem with so many benefit statements. They’re like flipping wallpaper; nothing really to make them stand out whatsoever. I always recommend to any business that I work with, before you start doing your networking and your 60 second ‘elevator statement’, before you write your sales letter, your flyers, before you even go near your website, sit down and draft this little benefit statement out. Better still, let’s keep changing and evolving it because you’ll have new things as your business grows and evolves and you get even more fabulous feedback from clients. You get more experience. So, your benefit statement changes. It becomes more enriching. There’s more detail in there. There are more little nuggets of information that you can communicate to those people that you know want to buy from you. More hooks, really, to get them. Julie Stanford: It is funny isn’t it, the number of people who, as you say, they list those things about them that are … There must be customers who are thinking, well you should be doing that! Julie Stanford: “We’ve got great customer service.” Well, you wouldn’t have lousy customer service if you wanted to be successful as a business would you? Dee Blick: Absolutely. Do you know, that’s a great example. In fact, it takes me back to BA, British Airways. They did some research with their customers about what they were actually looking for. They were assuming that safety would be top on their agenda; we go with BA because they’re safe. When in fact, what customers said was, well actually we love the fact that your staff are so helpful on the ground in terms of giving advice when flights are delayed. They assume that the safety was given. Well, I don’t really expect the plane to drop out of the skies. That’s a really important point. They are the basics that you would expect. It’s all the lovely extras like, if it’s a cake, what’s the icing on that cake of yours? What’s that big cherry on the top that really makes you an irresistible proposition? If you’ve not thought about it, you’ll just trot out what everybody else trots out. Julie Stanford: It’s those things that make you memorable. Julie Stanford: Also those things that make it easy for people that you meet when you’re networking to talk about you to other people they meet because, as you said, they’re the little hooks that they attach to you as a business owner and as a business, aren’t they? Dee Blick: Oh, definitely. I think that so many business owners in my experience, they don’t even include their biography in their benefit statement, so what led them to launch the business that they are in today? Because often, what makes them compelling and irresistible from the point of view of somebody looking to recommend them or buy their services, is the integrity that they’ve got. That they’ve got all this fabulous experience and suddenly they’ve channeled it into running a business. You see this on programs like The Dragon’s Den where the Dragons can sit glazed over until somebody bounds in and they tell about the story that led them to invent that gizmo. “The ice cream was an invention because my son had an allergy” and all of a sudden, we’re all ears. It makes us a bit different. It makes us stand out. Julie Stanford: Now as always, I’m sure you’ll have come armed to teeth with some fantastic examples of businesses, real businesses, that you’ve worked with and it puts the light on for us. Do you mind now telling us some examples of people that you think have done this particularly well or that you’ve had to help find their benefit statement? Dee Blick: I will do. I think the message of encouragement that I want to give to listeners is that you’ve got it. You’ve definitely got it. It’s deep inside, you just haven’t brought it out yet. Here are a couple of examples to inspire you. Low and behold within ten minutes, the MD, he’d produced this lovely little list, which said, “Well, firstly we’re celebrating our 30th anniversary in business.” That shows that they’re solid and dependable and continuous. Let’s face it, in the current climate we want to do business with businesses that we feel comfortable with, that we think you were there yesterday, you’re here today and you’re going to be here tomorrow. That’s important at the moment, particularly. I found out they were really competitive on price because they’ve got their own in-house manufacturing plant. They make everything in-house and they don’t outsource, so great on price. Again, that’s important for that kind of product in the current market. I found out they offer free local delivery and that the courier service, is for couriering around the country, they do it at cost. They don’t make a margin. I thought that’s nice. There’s a bit of integrity there and the fact that they should reveal that to a client is, we’ll just charge you what the courier charges you and no more. I found out that their turnaround times were unbeatable because I got them to share with me client case studies. That is so important. For example, one particular client, they had been told by a competitor that they had to wait two weeks for 300 boards. They turned it around in three days at the same price simply because they’ve got their own manufacturing plant. Dee Blick: No, they didn’t. Also, this idea of actually communicating little case studies, they enliven people’s minds. Suddenly I’m thinking, gosh that’s fantastic. 300 boards in a few days. That’s a part of your positioning statement; having those little nuggets of client information that shows this is what it looks like when it translates into practice. Another business that I work with, they adapt vehicles for disabled motorists and so their target clients are garages. Garages that have got what are called, ‘a motability specialist’. We made a really big play about their mobile workshop service. They’ve actually got mobile engineers that will come to the garage and adapt a client’s vehicle. This was so important, I found, in the recession. The recession hit the motor trade badly, as you probably know, really badly. My client thought he was going to suffer. We actually grew the business by 13 per cent. What did we do? We rammed home this mobile workshop message. We said to the guys on the forecourts, “You want to be on the forecourt selling. You don’t want to be taking a car to an adaption specialist miles away. There’s a cost to doing that. It takes two salesmen away from the garage. With our mobile service, we’ll come to you.” We looked at the positioning statement we’d created and said, okay times are changing. What do we need to do? What do we need to tweak? Is there a particular message that we need to really take out and highlight and drive this home to our target audience? We grew that business by 13 per cent in a year when sales were nosediving, because common sense showed us that that was the message that these guys on the forecourt would listen to most of all. They didn’t want to be driving a vehicle miles away. Another business that I’ve been working with, they sell motor products to motor factors. We did some market research. Every year, we do a little market research project. Boy, when we got the research back, we realized that we had to change the benefit statement to another positioning statement. We didn’t realise just how important it was that they were a friendly-family business with great responses on the phone and not having a call-handling service. That a motor factor picks up the phone and within a couple of minutes, he’s there talking to the MD. Again, we changed the positioning statement to reflect that fact that we knew that being a small business mattered to the customers. The message that I’m getting at is, go deep. Talk to your customers. Really find out what matters to them and don’t have this positioning statement as something that’s a solid block that never changes. We’ve got to make sure that it continually reflects what people are looking for. How do you begin writing a positioning statement? Julie Stanford: I love your examples of the people you work with because they really put the light on for me. Always, we like to in the last five minutes of our 15 minutes Masterclass, we like to really focus on how. Julie Stanford: Because when I was starting the running of my businesses, Dee, I always had this sense of, there were many, many people who would tell me what I needed to do. Julie Stanford: Actually, I’m not entirely sure they all knew how anyway! I would love it if you could now tell us, how do we put together this targeted positioning statement, the benefit statement, and make sure it’s perfect for the people we’re trying to engage with or to delight really because that’s the point of it, isn’t it? Dee Blick: You’re right. We do need to delight. What I’ll say in terms of time, you’re looking at probably about half a day’s work in total. The first thing, which is where I always start, is that flipping pad, and pen. Sit down for an hour or so and write down, really some of the recent projects. Write down the feedback that clients have given you. What were the ‘wows’ within that project or within that sale or within that relationship that you’ve got with a client? What are the really outstanding things that you have delivered? Because that’s what you’re being judged on. Another great thing to do is, check out a couple of competitor’s websites. Look at where you’re actually one step better. Don’t delude yourself. Be absolutely honest. Again, write that down. I think, involve your team. If your team is, in my case my husband who works with me, it might your hubby, it might be the couple of people that you work with. Ask them, “What do you think makes us so great at what we do?” Start to gather this information. Get it in your little pad or on your sheet. The really key thing as well is, talk to your clients or your customers and ask them, “Why do you do business with us? What do you think makes us pretty special? What have we delivered for you?” Now in a way, what you’re doing here is your collating information. You might end it with a few pages of notes. What I then want you to do is to distill it down into some really key points. Not things like, “We do great customer service”, but “You won’t have a call handling response. We don’t outsource our calls. You’ll always get through to the MD.” Be really specific. The other thing I’d say as well is, ask the people at your networking group if you’re not sure, “Why do you recommend me? Why do you recommend our products or our services?” I’d also say, don’t fall into what I call is, the red herring USP, our unique selling point is. I tell you, you don’t have to be unique to be successful provided you’re communicating these benefit messages with clarity, integrity, a bit of a sparkle in your eye, and enthusiasm, you can be so incredibly successful. You don’t have to be unique. Beware of lavishing superlatives on it. Make sure that you update your positioning statement too. That’s really important because where you are now is not where you’re going to be in maybe a few months time. Make sure as well that when you’re going to specific target markets that you look at any extras that you deliver into that market and add them. That’s almost like a little bit of a version two of your positioning statement. If you like, I look upon that positioning statement as a cake; the name main bit, the bit fruity bit, that’s the general positioning statement. The bit of icing, they may be the sector specific messages that you want to add onto it. When you’re talking to architects, you then speak about your experience in their sector whereas you wouldn’t do it with another group. Get all those points together. Try and distill it into a couple of pages and hey, presto, you have then got a fantastic communication that you can then use as a springboard for the most compelling literature, the best website going, and a brilliant elevator statement. Julie Stanford: Excellent. Do you know, as always Dee, I end up listening to you and I get this feeling of wanting to roll my sleeves up, get back to my office, and start on my work. 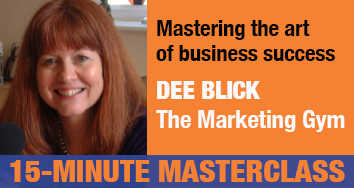 Dee Blick, thank you very much as always for a practical, useful, marketing Masterclass. Thank you Dee. Dee Blick: Thank you. It’s been a pleasure.